In this article we will show you how to use DateTimeGroupDescription with your DateTime and DateTimeOffset data. When using LocalDataSourceProvider you can choose between three types of group description - PropertyGroupDescription, DoubleGroupDescription and DateTimeGroupDescription (or implement your own group description, which inherits PropertyGroupDescriptionBase). PropertyName - defines the name of the property by which the data will be grouped. It is mandatory to set a value. Step - defines the grouping interval. Default value is Year, but you can change it to one of the following: Quarter, Month, Week, Day, Hour, Minute, Second. If you have the following dates: 01-01-2013 and 20-02-2013 and you set Step to Year, the two values will be in one group - 2013. But if you change the step to Month, the values will be in two different groups - January and February. When you have a property of type DateTime (DateTimeOffset), you can create several DateTimeGroupDescriptions with different steps. You may also create a PropertyGroupDescription - this way the DateTime will be treated as a string and grouped as such. All of them can be used simultaneously. You can add the description in RowGroupDescriptions or ColumnGroupDescriptions collections of LocalDataSourceProvider. As you can see, the folder gives you the ability to select different steps for your DateTimeGroupDescription at runtime and use them simultaneously. The names of the items are a combination of the property name and a step. Only the last item in the folder has different name - it contains only the property name. When you drag it, you will add the data as PropertyGroupDescription. 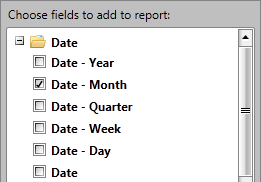 By default RadPivotFieldList will show the following steps in its FieldTree for each DateTimeGroupDescription: Year, Month, Quarter, Week, Day (you will also see additional item, which will create PropertyGroupDescription instead of DateTimeGroupDescription). But you can set three more steps - Hour, Minute, Second. So how to show them in RadPivotFieldList? //Find the children Date.Month and show it. 'Find the children Date.Month and show it.